recounted by a woman who normally suffered from sleeplessness and stress caused by demanding office work. to confront and fully experience the sense influences. to decide to drop an influence. to concentrate on something within. for a shorter or longer period, not to make yourself subject to or be occupied with influences. At a residential course, for example, conditions are provided where you are free of the reminders which normally put you under stress or give rise to worries. And it works – if you want it to and are willing to take advantage of the given conditions. It is also called a retreat, a place where one has time to rest and reflect. a symbol of such an isolation, and at the same time a very effective tool to rest the senses, is our so-called Pyramid at Haa Retreat Center in south Sweden. First of all, it is an isolation tank based on the ideas of Dr. Lilly from California. Different names are used for such tanks and they are now found in many places around the world. In 1981, Swami Janakananda taught at an institute on 5th Avenue, New York. There, he tried a small coffin-shaped tank. It was far from perfect in it’s construction, but the experience was positive and the idea was born to build our two relaxation tanks (earlier we also had a pyramid in our school in Copenhagen). However, they were to be of better quality, more spacious and pyramid-shaped. Why not gain from the possible beneficial effects of the pyramid shape? In 1930, André Bovie found that animals who had died in the Cheops Pyramid did not rot, but were mummified. Karel Drbal from Czechoslovakia, took out a patent in 1959 to use the pyramid to make knives and razor blades stay sharp… Perhaps the ancient Egyptians and other people of that time held a greater knowledge of the pyramid’s influence on human beings than we imagine today. Apart from the famous pyramids in Egypt and Mexico, many large pyramids are found in Australia and also in India, France and South America. Our pyramids are exact models of the Cheops Pyramid, only smaller. They are placed with the sides facing north, south, east and west. Inside, there is a water basin, about 1ft. deep and 8ft. x 8ft. wide. The 1000 litres of water contain one ton of magnesium sulfate (Epson salt). Consequently, when you lie on your back in the basin, you float with effortless ease and you feel weightless. The temperature of the water is about 95°F or 34,1 C° – skin temperature, therefore, neither heat nor cold are felt. The room is isolated from both light and sound, so you neither hear nor see anything. And the air is constantly ventilated. “My times in the pyramid gave good results when I took my examinations“, several students commented. When you are in the Pyramid, all sense impressions are strongly limited. In daily life your senses are continuously influenced – even when you sleep, the senses get no rest, the body moves in the bed, and both light and sounds are recorded. The sense impressions, which you receive throughout the day, keep the mind going. A sound, something a passer-by says, talking with another person, music, light, temperature, even gravity – everything influences you. When the senses do not receive any impressions from outside, no new reactions are created in the mind. 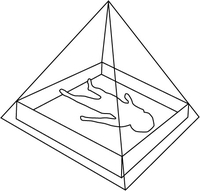 A stay in the Pyramid lasts about 45 minutes to an hour, where you float completely still on your back. No techniques are required. When the senses are allowed to rest, the relaxation happens by itself. Right after lying down, your mind is full of ideas and reactions to what you have experienced during the day, or you are occupied with the pyramid and sounds from your body. Because you do not receive any new sense impressions, your state becomes clearer, and you may get absorbed in thoughts and feelings which are more relevant than whatever occupies your mind while rushing through the day. You now find pleasure in having time to deal with this, or you suddenly become aware of a tension and let go of it. You are not planning this. You do not have to experience or do anything in particular. Just float and let happen what happens by itself, in the mind and in the body. Then the hour has passed and you are gently called out again. Your mind has calmed down, your senses are rested, you are vital and ready for new impressions. PS: During resent years, plastic containers have been produces according to similar principles. They are now called “Flotation Tanks”. Those who have made them, however, have made one mistake, they have installed loudspeakers with music! Therefore, if you visit such a tank in your neighbourhood, ask to have the music turned off and thus get the full benefit. Hopefully, it will be well insulated from the sounds of the surroundings.